Does Displacement Wave destroy auras? How do Prowess and losing abilities interact? 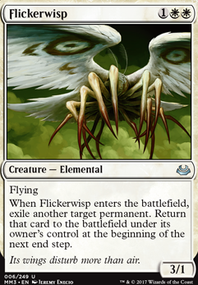 guttersnipe is just terrible in modern.. 3 mana that could easily have just been another bolt, and there is a million better options than shock, most of which are fairly cheap. dont forget Abbot of Keral Keep! The entire deck feels decent enough for a casual list. Personally, I like 'return to hand' enchantments like Angelic Destiny or Conviction. 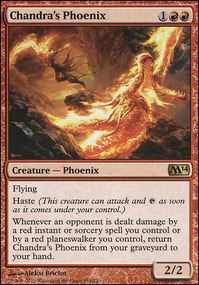 If you want to make it more competitive and stay on theme, just drop the curve and run a ton of Seeker of the Way/Monastery Swiftspear/Abbot of Keral Keep backed by Path to Exile (or Oust) and lightning bolt. Its a proven archetype. 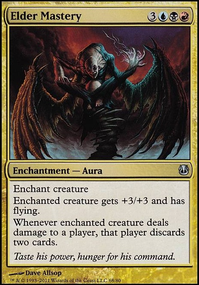 I'm not sure if you have any specific budget, but Deathmark should definitely be switched out for Fatal Push if you are going to keep removal in your sideboard, as it hits a much larger percent of Modern creatures and is an instant. My first suggestion would be to remove all the basic swamps from your deck and replace them with 4 spells. Since your average cmc is about 1, 24 lands is way too many and you will most likely flood every match. 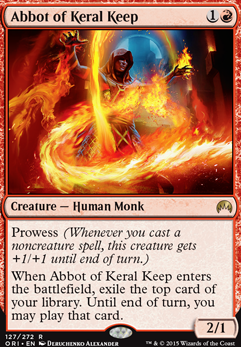 I would replace them with Abbot of Keral Keep because it fits well with your reanimator theme and helps you dig through your deck for more damage, plus it has prowess so he can be a decent beatstick as well if your opponents don't keep an eye on it. A fun card could be the newish Olivia, Mobilized for War, as she can give Vexing Devil +1/+1 and haste for the small price of a discarded card AFTER your opponent decides whether or not to take the damage. However, she does cost 3, so it may be awkward to play her. Instead of Spike Jester, I would put in either Shattering Spree (against Affinity), and instead of Rain of Gore I would put in Skullcracks because they aren't dead cards if your opponents end up not gaining life. That's all I can think of right now, otherwise this deck looks really fun to play! 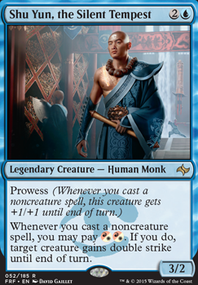 Abbot of Keral Keep is at most a 2-of in a deck with so many relatively expensive spells as this one (you'd rarely want to play it turn 3 in the hope of hitting a 1-mana spell, right?). 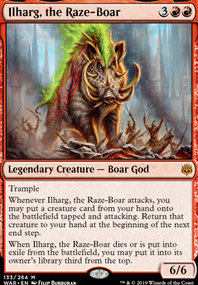 2 more Thoughtseize would be pretty good, though. Implement of Malice... I suspect that it is too expensive in mana, but it trades for a card from opponents hand, replenishes itself, and if you could find a little bit more artifact, it could enable delirium, so you could play Whispers of Emrakul instead of Wrench Mind. Noxious Gearhulk also fits the description: You get a decently sized creature, kills another creature, and gets a bunch of life. 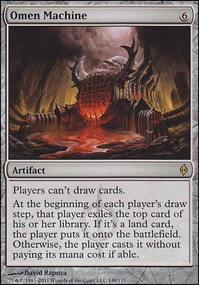 Only problem is the cost (at 6 mana it's probably over the top of the curve). Actaully, if your curve went that high, you could add the titans too. Gatekeeper of Malakir is an obvious 2-for-1. 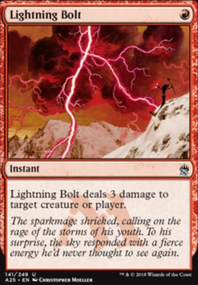 You could mix up with red for Abbot of Keral Keep and Blightning, both of which are 2-for-1'ers.